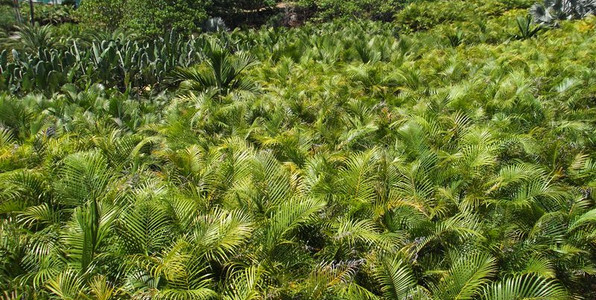 This nursery was established in 1988, back then the palms were grown in the ground and dug out with a high-pressure water blaster and put into 100 litre bags. The process was hard work and the plants were stressed for a year after transplanting, also the use of heavy equipment was needed which added to the final cost. Today the palms are grown in full sun (except for Kenta's and Rhapis) under an irrigation system in 45 litre bags. This size bag can be easily moved by barrow (trolley) and still support large palms of up to 4 metres, 9 bags also fit onto a truck pallet for easy shipping. Plants begin in the nursery from seed or seedlings in a 3-inch plastic tube for a year, then into an 8-inch pot for another 1-2 years all under 70% shade cloth. Then into a 45 litre bags and placed in full sun, they are then ready for sale in 2-3 years. All up the palms are sold at around 5-6 years of age. The sunny weather and subtropical rainstorms make the north coast an ideal place for palms. A good water supply is one of the most important parts to the nursery, which is why we have a number of dams in the two valleys that lead to the central pumping system. Go to Main Arm Rd and turn left into Coral Ave after the Mullumbimby Show Ground. and leave your phone number. We do not dig palms out of the ground or buy advanced palms.